EXTERIOR DESIGNING-Breathable and moisture-wicking design helps keep moisture off feet. DURABLE ODOR-FREE MATERIAL AND SWEAT-WICKING TECHNOLOGY-Made of regenerated cellulose fiber, which is infused with silver, using a base material of polypropylene (also naturally bacteria resistant) and combining with LYCRA , 100% recyclable and non-toxic quick drying material. 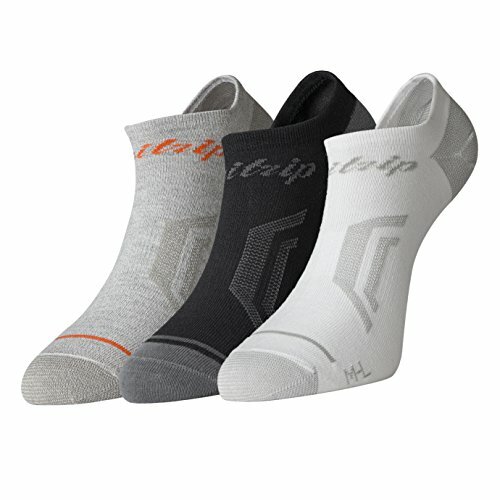 HIGH QUALITY MATERAIL-OUR FAZITRIP RUNNING SOCKS are made of regenerated cellulose fiber, which is infused with silver, using a base material of polypropylene (also naturally bacteria resistant) and combining with LYCRA , 100% recyclable and non-toxic quick drying material. ULTIMATE FIT-mesh panels and arch compression for breathability and a snug, comfortable fit when working out or competing.Hand-linked seamless toe closure; Heel tab and enhance elastic ribbon help preventing the sock from slipping into your running shoe.Enhanced elastic grip construction in both arch and ankle to provide ultimate support and second skin fit . Unique Triple-Y heel creates a deeper heel pocket, ergonomically formed to the shape of your heel, for ultimate fit and comfort. SIZE AND SERVICE-Medium (Women's 6-7, Men's 7-8), Large (Women's 7-8, Men's 8-10),X-Large(Men's 10-12). Due to the stretchability of the sock, for more SUPPORT choose one size down in the size chart. Satisfaction guarantee-if you are not completely satisfied with your product, simply return them to us for replacement.